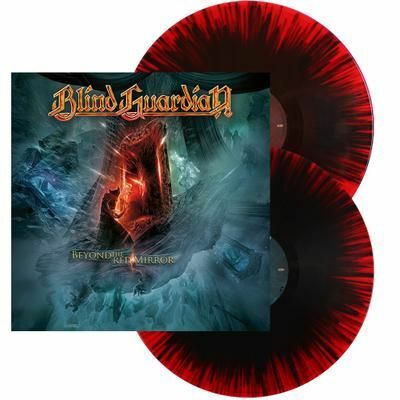 BLIND GUARDIAN - BEYOND THE RED MIRROR SPLATTER VINYL (2LP) | Online Shop | Wizard LTD. Album: "BEYOND THE RED MIRROR SPLATTER VINYL (2LP)"
ANOTHER EXTREMLY INDEPENDENT, MULTIFACETED AND MUSICALLY AMBITIOUS MONUMENTAL ALBUM!! Even before the dawn of our space age, humanity had the audacity to conceive of ourselves as a life form not bound to the planet that birthed us. More than anything, leaving terra firma required all of our amassed knowledge, talent, and imagination. Such is the case with BLIND GUARDIAN, a band from Krefeld, Germany that refuses to be bound to the genre of music that spawned them and whose accumulated knowledge, talent, and imagination have created portals into senses beyond the five we experience in common, ordinary life. With that background established, prepare yourself for a trip that will overwhelm all your known senses and reveal something truly extraordinary. Greatly inspired by life experience, world myths, legends, and their own fervent creativity, metal’s most epic storytellers BLIND GUARDIAN continually aspire to define themselves on a whole new level. With their highly-anticipated, orchestral tenth studio album »Beyond The Red Mirror«, they have successfully captured the scope of their essence with unprecedented accuracy. By far, the most important fact about the new album is this: there are no compromises. Not one. This is not a typical soundtrack or musical or rock opera. It is, simply, typical BLIND GUARDIAN. Set for release in early 2015, »Beyond The Red Mirror« has raised the bar on the gold standard trajectory the band had set themselves on when they first formed. These ten new tracks will transport the listeners - via a mysteriously powerful red mirror - into an otherworldly dimension that includes tyrants, gods, and the Holy Grail. And it’s no coincidence that »Beyond The Red Mirror« bears strong lyrical ties to 1995’s »Imaginations From The Other Side«, for we are reunited with the young protagonist we first met twenty years ago in the songs ‘Bright Eyes’ and ‘And The Story Ends’ who stood before a magic door, unsure whether to make the leap into a new, unknown world or to stay in his own. Now an adult, the impact of this important moment in the protagonist’s life is the launching point for the entire album. Opening with a surging tidal wave of emotion created by a spine-tingling choir and a full orchestra is »Beyond The Red Mirror«’s first gem, the nine-and-a-half minute ‘Ninth Wave, a consciousness-expanding palette of landscapes and moods bearing the message of an urgent mission still desperately searching for a resolution. An endeavour demanding that attention be paid to the lyrics as much as to the music, what follows is a desperate search for truth, an exploration of the relativities of good and evil, the consequences of lost opportunities, a glimpse into a distant universe’s dystopian society, a prophecy, a promise of revolution, a plot for revenge, and a miracle machine with powers far beyond what mere mortals could have dreamed possible. Closing with an explosion of heroic harmonies & choral glories with a second nine-and-a-half minute, self-contained saga named ‘Grand Parade’ (cited as “the best song we have ever written” by Olbrich), BLIND GUARDIAN’s grandiose, uplifting, and ingenious storytelling is guaranteed to leave you breathless. With »Beyond The Red Mirror«, you will experience why BLIND GUARDIAN is so undeniably influential and absolutely without equal in the pantheon of heavy metal music.